Dig in your drawers and find the raw materials for your next fabulous DIY. 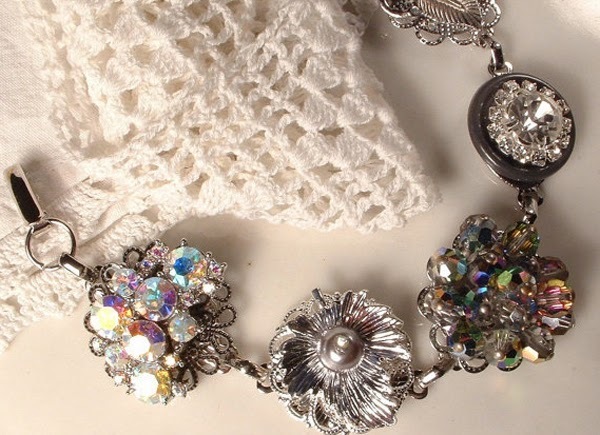 Old brooches and chains can be transformed into new jewelry and other embellishments without spending a dime. 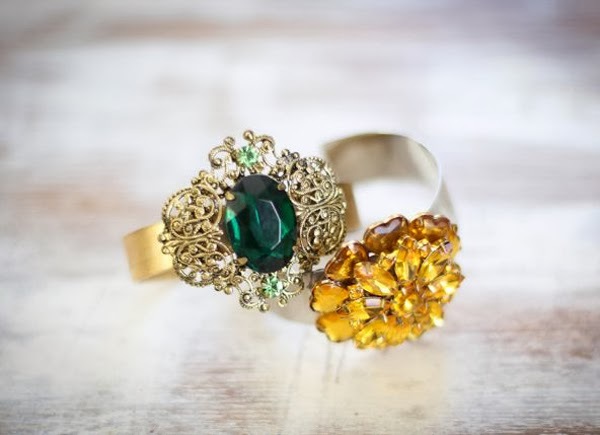 Many of the projects I found refresh vintage jewels without doing any damage to them, so you can keep grandma's gems in the same shape you received them. Topping the fabulosity chart has to be this Dylanlex stacked necklace, above, featured at A Pair & A Spare. 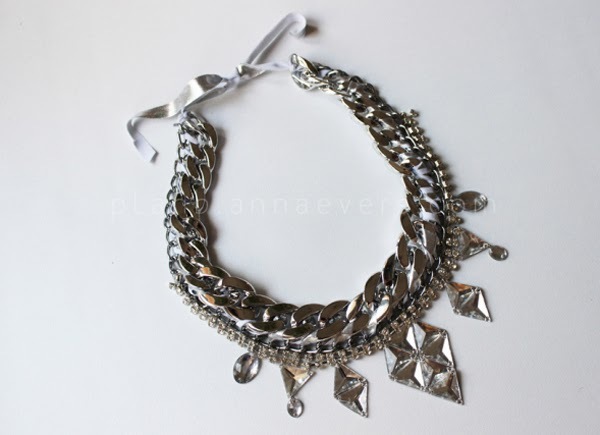 Silver maxi necklace made by combining inexpensive chains at Anna Evers. 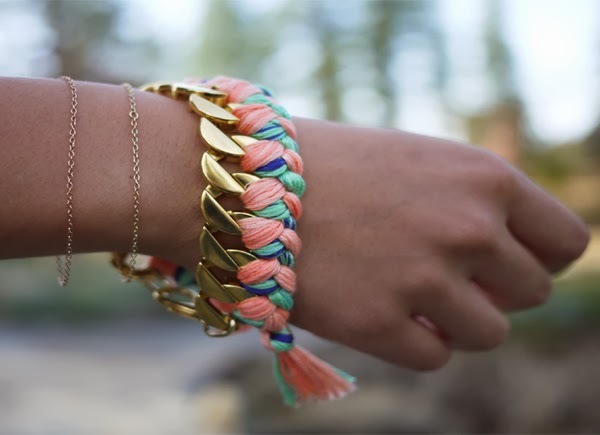 Bracelet inspiration from Etsy shop Amore Treasure. 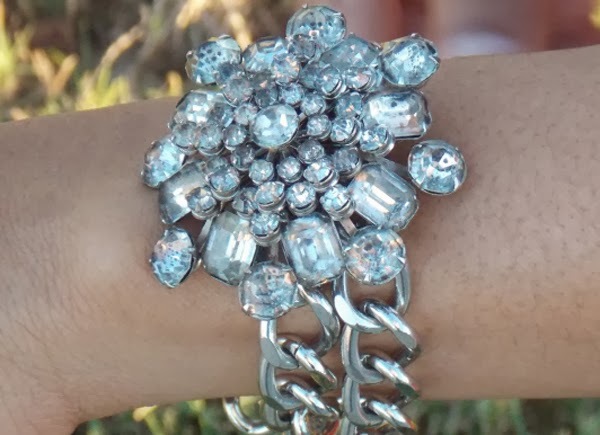 Dishfunctional Designs shows you how to use bracelet blanks to create a similar one. 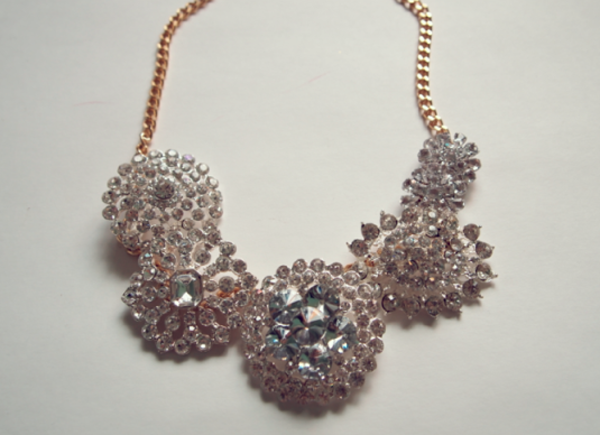 DIY drama necklace from Anna Evers. 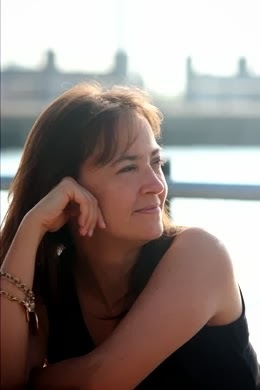 Connie from Artful Play used filigree and vintage jewelry pieces to create this necklace. Rebecca at A Bit of Sunshine merged two trends by turning a brooch to a necklace and painting the rhinestones with nail polish. 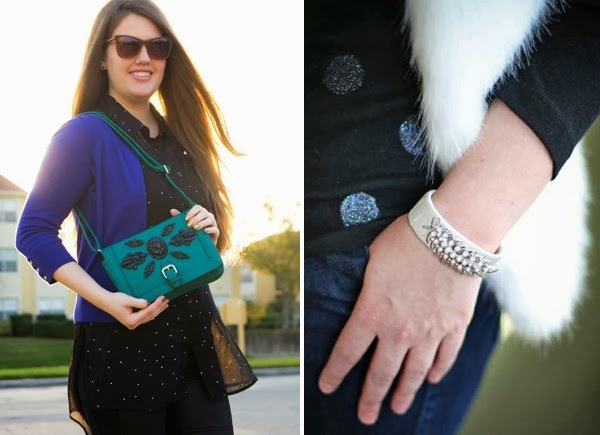 Make a brooch chain bracelet that doesn't damage the brooch with a project from Why Buy It? DIY it. Turn odd earrings into rings like Laughter and Lemondrops. Tanya at Dans le Townhouse turned a broken 25-cent garage sale brooch into a necklace. 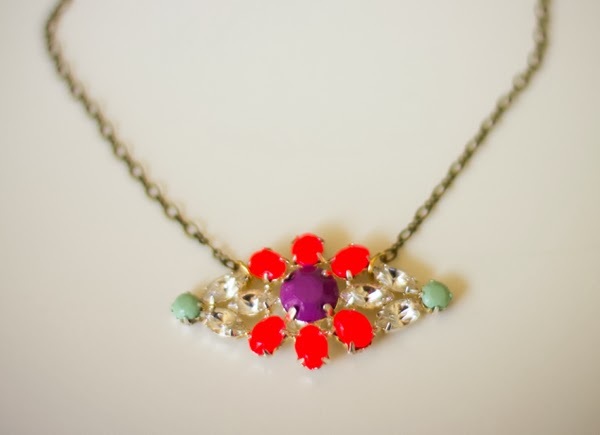 Kristen at Glitter 'N Glue made this beautiful and clever necklace using brooches and safety pins. Safety pins! No damage to the brooches. My own J.Crew One-of-a-Kind necklace made from vintage brooches. My J.Crew flower lattice necklace from old brooches. Neither one damages the pins. 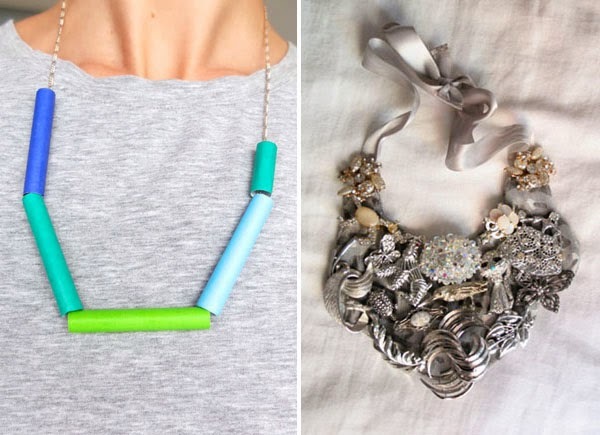 Turn wimpy delicate chains into a bold necklace with Cintia at My Poppet. 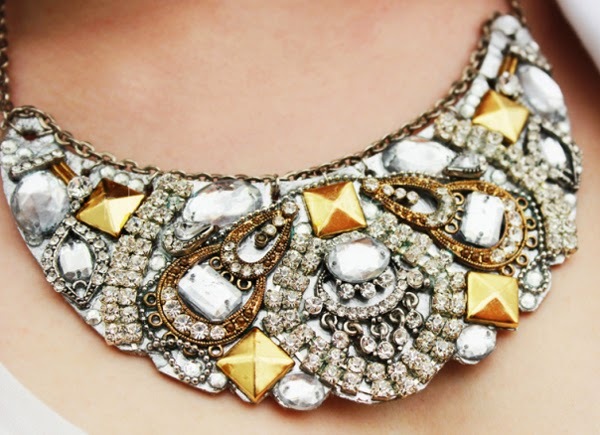 My vintage pin bib necklace. It does not damage the pins. Kara at Sprinkles in Spring chopped up a Forever 21 necklace to make this Givency-inspired bag. Stephanie from Henry Happened turned a brooch into a bracelet for a project at Petit Elefant. 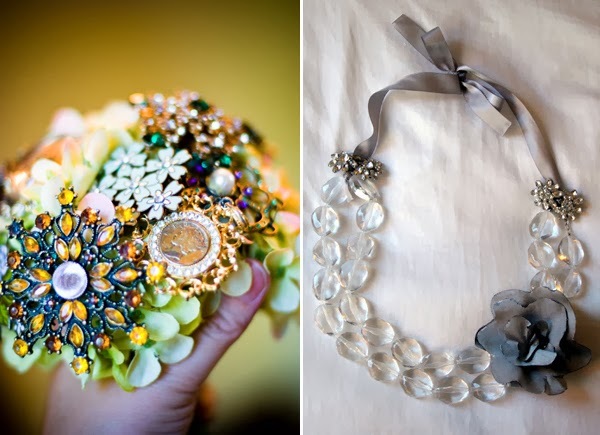 Make a bridal or prom bouquet from vintage pins. My own super easy Talbot's inspired necklace, my most popular post ever, made from an old necklace and old earrings that takes approximately two seconds to make. 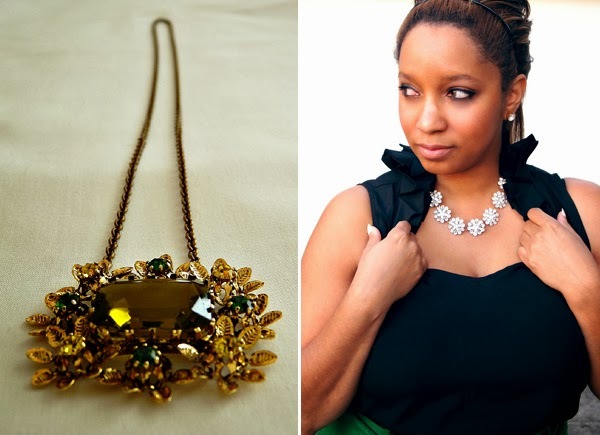 Alyssa from Elemental Carbon made this bib necklace from pieces of broken jewelry. 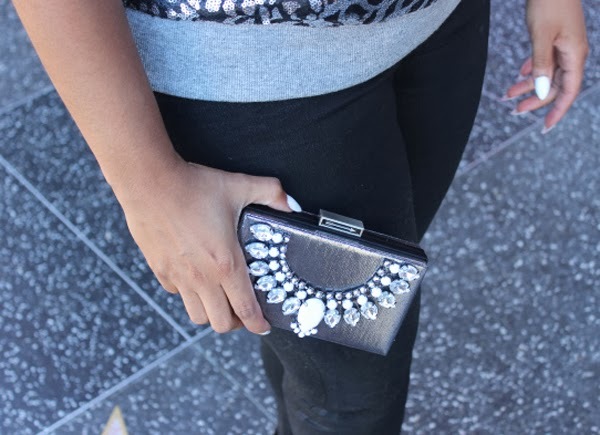 Turn a necklace into an embellishment for a clutch like Kristen at Glitter 'N Glue. Kristen at Glitter 'N Glue also made this one by pinning brooches onto a chain. No damage to the pins. Stephanie from Henry Happened also made these brooch bracelets for a project at Eat.Sleep.Make. 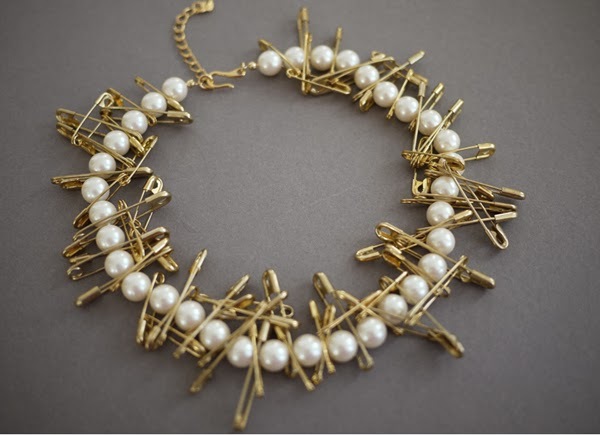 A Tom Binns inspired pearl and safety pin necklace at Honestly. Geneva at A Pair and a Spare mixed a pile of chains into a single necklace. 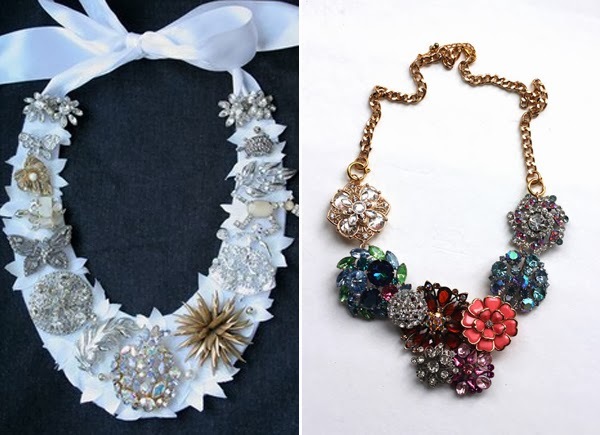 Incorporate an old rhinestone necklace into a crochet statement necklace like Cathy at Trinkets in Bloom. Update a curb chain bracelet with embroidery thread with the iconic project from Honestly. That's only 24 projects. I've got a new one on the way. How did I miss your J.Crew-inspired lattice necklace? I love it! 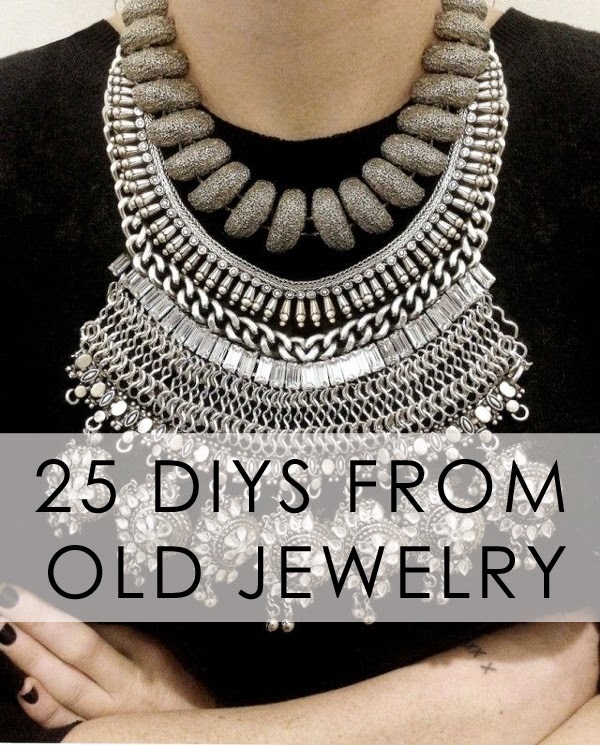 And the other bib style J.Crew necklace you made? Amazing. I love it. 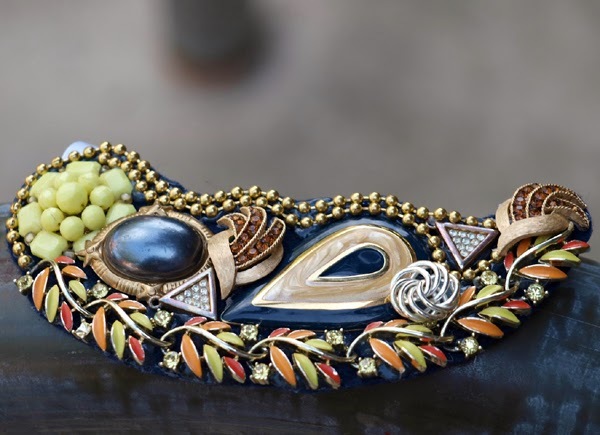 Did you find all of your brooches at the thrift store? You've inspired me to keep an eye out for them from here on out. I inherited most of them from my grandmother. She had a vast collection. Which I have since added to via thrift shopping. I also have a few Styled by Tori Spelling pendants in there. Can I send all my old broken stuff? I'm sure whatever you make will be fabulous. Can I send you all my broken jewelry? I'm sure that whatever you make will be fabulous? Very nice. It turned out great. Beautiful stuff. i do not wherever jewellery usually and positively cannot afford it right away, however this is often the kind of Jewelry stuff I'd love!